With the weather getting warmer, now is a great time to get active in the water. Going for a swim is a great way to stay active as it promotes muscle strength and cardio activity. It’s also a good way to cool off on a hot day. Anyone can benefit from being active in the water, even people recovering from an injury. Did you know that water can be used as a form of rehabilitation therapy called Hydrotherapy? To put it simply, Hydrotherapy is defined as restoring, maintaining and regulating health by using water. Hydrotherapy is not just one exercise. There are many different treatments one can use when doing Hydrotherapy. Treatments can include but are not limited to hot or cold compresses, hot baths, high-powered jets, and steam rooms. For example, steam room treatments relieve water tension in the body by inducing sweat. Thus, sweating out any impurities the body may have at the time. Hydrotherapy is not limited by age. Anyone can benefit from this therapy. When thinking about Hydrotherapy, many people would assume you have to immerse yourself in water. This isn’t necessarily true. 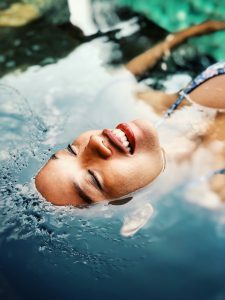 Though you can do Hydrotherapy in hot baths or whirlpool baths, there are many other ways to use water that does not involve wearing your bathing suit. In fact, applying a cold-water compress directly to the forehead is considered a Hydrotherapy treatment. Temperature also plays an important role in Hydrotherapy. Depending on the ailment, hot or cold water can be used. Cold water restricts blood flow to decrease inflammation by constricting blood vessels in the body. Hot water can ease stiffness in muscles and joints by increasing blood flow in the body. Using hot and cold water together can improve blood circulation and activate organ function. To see if Hydrotherapy can benefit you, please consult your doctor first. For more information on hydrotherapy, click here.